Former UCLA quarterback Cade McNown and linebacker Ken Norton Jr. landed on the ballot for the 2018 College Football Hall of Fame class on Thursday. 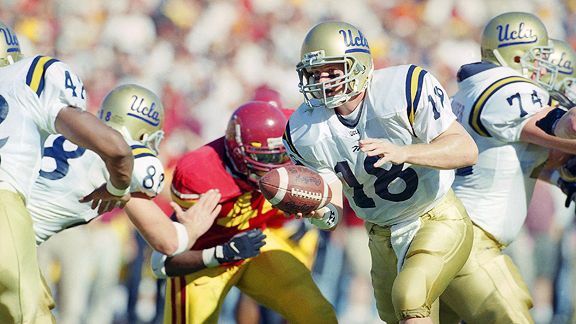 McNown (1995-98) was a consensus All-American in 1998 while winning the Johnny Unitas Award. He was third in the Heisman voting and a finalist for the Davey O-Brien Award after setting UCLA season records for passing yards (3,470), touchdown passes (25) and total offense (3,652), all marks that have since been broken. He is still the school leader in passing yards (10,708) and ranks second in total offense (11,285). The West Linn, Ore., native led the Bruins to a school-record 20 consecutive wins during his junior and senior years. Norton (1984-87) was an All-American in 1987 and was a finalist for the Butkus Award. He led the Bruins in tackling during his junior and senior years and ranks eighth on UCLA’s all-time tackles list with 339. The Westchester High alumnus helped the Bruins to four consecutive bowl wins and the conference championship in 1985. After he was picked in the second round of the 1988 NFL Draft, Norton became the first player in NFL history to win three consecutive Super Bowls (1993, 1994 with Dallas, 1995 with San Francisco). The National Football Foundation announced the ballot that includes 75 players and six coaches from the FBS level and 98 players and 31 coaches from the FCS level and below. After votes are counted, the 2018 class will be announced Jan, 8, 2018 and inducted on Dec. 4, 2018. This entry was posted in Football and tagged Cade McNown, Ken Norton Jr. by Thuc Nhi Nguyen. Bookmark the permalink. I would like to hear the thoughts from some of you if Cade McNown should be in the HOF? 4-0 against the condoms. Not bad. Ouch. That was obvious, but I meant what you all thought besides USC/UCLA. I think the guy won 20 games in a row with a questionable D. I mentioned Robinson because he was highly complimentary towards McNown. I would say he is worthy. Carrier was a Thorpe winner so that is usually good enough for them. If Carrier deserves to get in (ha) so does Nate Shaw. Looks it up. he was our B___. He also has a history with Fisch. Plus, he’s an excellent student. Sounds promising. Very. He’s huge. Did u read what I also wrote re Malcombe Bunche ? I think it’s difficult to predict what Rosen may do. I certainly don’t think it’s 100%. If he feels he could use another year with Fisch, he may opt to stay. His circumstances aren’t typical. Hi Sam. This is what I think of Cade “The Handicap Sticker Thief” McNown. Miami 49 UCLA 45. Huge upset pulled by the Canes on the #3 ranked bruins to keep them out of the National Title Game. Edgerrin James had a career day with 39 carries for 299 yards and 3 TD’s. I guess McNown should have played D. And Melsby’s knee wasn’t down. You may want to review McNown’s stats that day. Did SC lose to Texas because of Leinart? USC vs Texas was a team loss, but USC gets to and wins National Championships. McNown had a chance to lead his team late in the game and failed. I would rather lose in the title game then never get to one. He didn’t get the job done.